Sure, it might seem easier to hand your blade to a sharpening service or a savvy friend, but it'll probably cost you a few bucks (at least) and you'll be missing out on what we believe is an essential part of owning a knife -- taking care of it yourself. We've put together this primer to get you started. It's not our aim to turn you into an expert on knife steels or blade patterns or even sharpening itself. We simply want to provide you with the basics. Where you take it from there is up to you. Before we answer that question, let's start with why it's important to have a knife that's actually sharp. Obviously, a sharp knife is better at doing what it's designed to do -- cut. It's more efficient and more effective. What may not be apparent, especially to the novice, is that a sharp knife is safer than a dull one. When a knife loses its edge, more force must be applied behind the blade to do the work. Pushing hard on a knife can cause it to slip, and that's a quick ticket to injury -- even a dull knife can hurt you. A keen edge does the work almost by itself, cutting with far less effort. It's your knife. You will be the first person to sense that its edge is getting dull -- not a sharpening service, not your buddy, you. It only makes sense for you to make the commitment to keeping your knife effective and safe. How difficult is sharpening a knife? Is it hard to learn? Relax -- sharpening isn't some mysterious black art. Time. Very few of us put the perfect edge on a knife the first time we try our hand at sharpening, and that's ok. Doing so takes experience, practice and the investment of time. We're confident that most people can develop the skills and natural "sharpening sense" to put a wicked-sharp edge on virtually any blade. 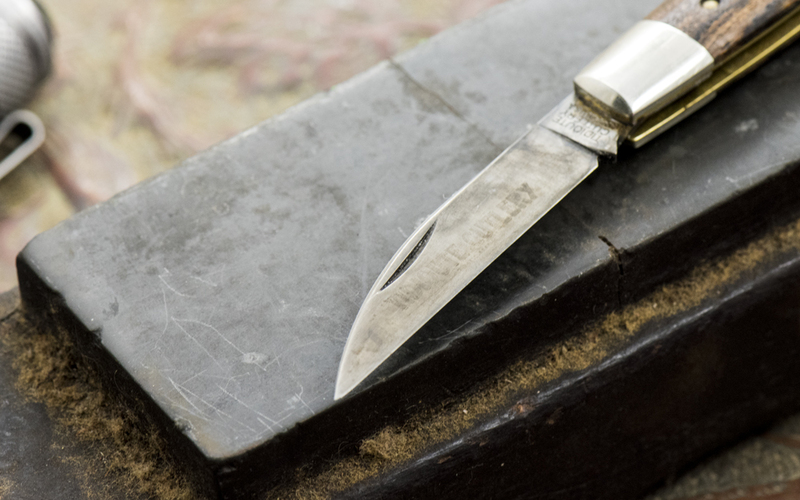 If you are nervous, or even if you are not, try starting with an inexpensive knife. Make mistakes and learn the basics on a knife you don't care about. Next, you'll need to choose the level of "abrasiveness" of the stones, rods or compound you'll use. If you're starting with a truly dull edge, you'll want to begin with something relatively aggressive. A simple touch-up job, on the other hand, could be done with something finer. You'll also need to consider the type of steel your blade is made of. Many of the current crop of "super" stainless steels -- M390 and ZDP-189, to name two -- are notoriously stubborn and require more abrasion, especially if the edge is deadly dull. Ordinary carbon steels and some tool steels, like 1095 and A2, are friendlier and yield more easily to medium- and fine-grit stones and compounds. A word of caution: If you're new to knife sharpening, you're likely to choose something more aggressive than you actually need. Until you develop a sense for your knife and your sharpening system, we advise starting with a finer stone or compound. If that doesn't work you can always move up to a tougher abrasive, but you can't put back steel you've enthusiastically ground away. Take it easy. Last but not least, a few knife patterns require specialized sharpening tools and techniques. The American tanto (with its multiple bevels), serrated edges (which can't be honed with flat stones) and recurve blades (S-shaped edges) are a few examples. If you have such a knife, be sure that the sharpening system you choose can accommodate it. I have a bench grinder in my garage and an electric knife sharpener in the kitchen -- couldn't I use those? Yes, it takes friction to sharpen steel, and an abrasive wheel spun by an electric motor will definitely produce friction -- but at a speed that also generates excessive heat and quickly chews away that precious steel you paid for. It doesn't take long to turn a fine knife into a brittle stick of overheated steel. Okay, I've determined that my knife has a V-bevel -- what are my sharpening options? Generally speaking, there are two types of sharpening systems for V-bevel edges: freehand and guided. We'll take a look at each here, with some examples. Freehand sharpening is the time-honored way to sharpen a V-bevel knife, drawing the edge across a hard, flat stone, treated with water or honing oil, specially designed for the purpose. The sharpening motion is easy -- hold the knife at the angle of the bevel and lightly stroke it across the stone in a slicing motion, edge-first. In simple terms, achieving a sharp edge is a matter of honing one side of the bevel until a "burr" is raised along its length, then flipping the blade over and repeating the process with progressively finer stones. As we said earlier, the stones you choose will depend on your knife's steel and how much sharpening is required. Sharpening stones used with the freehand method can be either natural or synthetic material. Here at KnivesShipFree, we carry the Japanese Water Stones advocated by renowned knifemaker Murray Carter, along with Murray's excellent instructional videos (on DVD) providing step-by-step guidance. We also offer highly respected products from DMT, which use diamond-based stones to produce a keen edge. 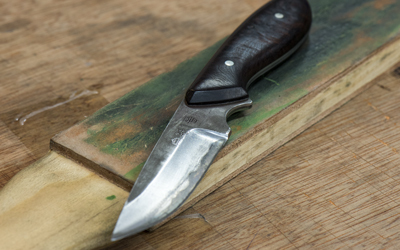 In our opinion, sharpening a knife freehand is a most satisfying experience -- it's relaxing, almost meditative, and it can produce a beautifully sharp edge. On the down-side, it takes time -- not only to do the sharpening itself, but to learn to do it well. Probably the biggest source of frustration comes from an inability to consistently hold the knife at the same angle, stroke after stroke, for both sides of the blade. We're only human, after all. It can be done, but it takes practice. Guided sharpening rescues us from our humanity by introducing a measure of precision to the process. These slick systems employ some combination of clamps, magnets, gauges and guides to maintain a consistent relationship between knife and hone. The most common complaint about freehand sharpening -- failure to consistently keep the edge at a constant angle to the stone -- thus is answered. The rest of the process is the same as with freehand sharpening -- hone one side, raise a burr, flip and repeat, move toward finer stones. The DMT Aligner, available from KnivesShipFree, uses a knife clamp with built-in guides for various angles, along with a hone-holder to accommodate DMT's selection of diamond stones. We also carry DMT's Magna-Guide system, which holds the stone in a nifty magnetic device. For folks with many knives and a serious interest in sharpening, we recommend either Edge Pro or Wicked Edge. Edge Pro offers two kits -- Apex and Professional -- and a complete line of water stones and accessories. The Wicked Edge guided system uses an array of diamond stones, ceramic stones and leather strops, along with diamond paste in various grits. If you want the very best in guided sharpening, these are the systems to consider. There's one other product, the Spyderco Sharpmaker, that we want to mention in this section. It can be thought of as a guided sharpening system, since it holds the abrasive surfaces (triangular sharpening sticks) at a constant angle. On the other hand, it's a freehand system because it relies on the user to hold the knife vertical while drawing the edge across the hone. A lot of folks find the Sharpmaker a good compromise and use it quite successfully. And if your knife has a serrated edge, it works great for that. All guided sharpening systems come with the obvious benefits of precision and, compared to freehand sharpening, speed. Plus, they make it possible for almost anyone to achieve a sharp edge -- first time, every time. The only negative we can think of, really, is that guided sharpening is so easy that novices may over-sharpen their blades, especially with more aggressive grits. Even so, the pros of guided systems far outweigh the cons. Before getting into the "how," first we're going to talk about the "why" of convex edges. When you think about the edge of a knife, you probably picture a V-bevel -- an angle, two flat surfaces producing a sharp edge. A convex grind, with two gently curved surfaces ending at the edge, is fundamentally different, so a flat sharpening system designed to hold a precise, consistent angle won't get the job done. What's required, then, is an abrasive surface that ever-so-slightly "gives" to follow the curvature of the blade. The best solution is a leather strop -- a piece of leather affixed to wood base, with abrasion provided by stropping compound or sandpaper. For complete step-by-step instructions on honing convex edges, we refer you to KnivesShipFree's series of knife-sharpening videos. We're proud to say that literally thousands of people have learned how to put an edge on their convex knives after watching these excellent videos. KnivesShipFree offers a complete selection of tools and supplies for sharpening and maintaining convex edges -- strops, pocket hones, compounds and even complete sharpening kits that you can carry with you into the field. The stropping compounds we carry are from Bark River Knives because, although there are many other brands on the market, that's what they use. And if they're good enough for the crew in Escanaba, they're good enough for us. For stropping today's "super steels" that don't yield as easily to standard compounds, you may have to use diamond paste (we carry the Wicked Edge brand) or the CBN (Cubic Boron Nitride) Sharpening Emulsions from Bark River. Those products, and a little extra patience, will give you great results with even the most stubborn steels. Like freehand-sharpening a V-bevel, stropping a convex edge takes time to accomplish and practice to master, but it's not rocket science. The results will be worth it, we promise. What's more, stropping is a great final step to sharpening any knife -- in fact, like many of our customers you may end up making it your only sharpening method, for all of your knives. Just remember, we have the very best instructional Convex Knife Sharpening Videos anywhere -- and they're completely free. How will I know when to stop sharpening? Is there an easy way to tell that my knife is sharp? One more question -- is there a secret to knife sharpening? Yes, as a matter of fact, there is: Don't sharpen your knives. Ok, we said that just to get a rise out of you. Put another way: Don't sharpen your knives -- maintain them. If you're playing the game right, you'll only rarely need to truly sharpen a knife. Sharpening is for well-and-truly dull blades, a condition you'll seldom see if you maintain the edge. Use the tools and techniques we've covered in the previous sections, take time to care for your knife the way you should, and you'll always have a blade that does what it was designed to do.